Some, like New Mexico's Deb Haaland, are now poised to make history. She could become the first Native American congresswoman. 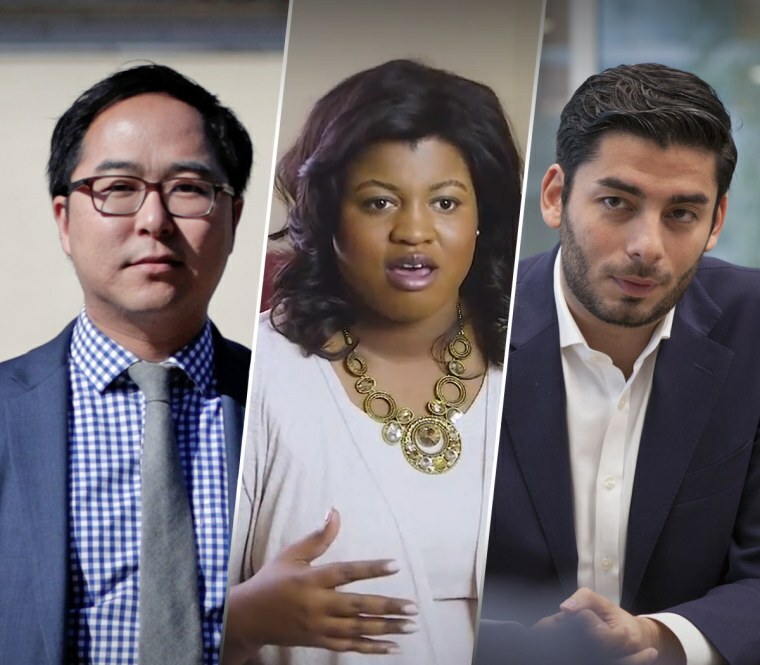 Seven Obama alumni won their primary contests Tuesday, out of the 16 candidates with ties to the former president who competed in what was the biggest night of voting so far this year. That brings the number of candidates connected to former President Barack Obama who are advancing to November's general election to at least 17, according to an NBC News tally on Wednesday. According to the Obama Alumni Association, which is tracking the bids of former staffers, more than 66 veterans from his political campaigns, two administrations and Senate office are running in federal, state or local elections this year, and more may add their names as the primary season continues. A couple of the June 5 races, which occurred in California, Montana, New Jersey, New Mexico and four other states, saw alums pitted against each other. And in some cases, their success Tuesday has them poised for historic firsts. Deb Haaland, 57, who according to The Associated Press won the Democratic primary in New Mexico's 1st Congressional District, would be the country's first Native American congresswoman if she wins again in November. She was a full-time Obama volunteer in 2008 and the New Mexico Native American vote director for his re-election campaign in 2012, and credits him with helping her find the courage to run. Many of her volunteers date back to those campaigns, and her office is still decorated with old Obama signs, she told NBC News last month. “I feel like if I hadn't worked for the president, I would never have had the courage or the wherewithal to run,” she said at the time. "I think about him every single day." Deidre DeJear, 32, won the Democratic primary for secretary of state in Iowa, where she'll challenge the Republican incumbent, Paul D. Pate, according to The Associated Press. DeJear was the state's director of African-American outreach on Obama’s 2012 campaign, and a volunteer on his 2008 campaign. She is the first black person to be nominated by a major party to statewide office in Iowa, and if she wins in November, she would be the first to be elected to statewide office in Iowa, too, according to WQAD. DeJear defeated Jim Mowrer, who worked at the Pentagon during the Obama administration and on Obama's 2008 campaign, according to his LinkedIn page. Campa-Najjar was a deputy regional field director for Southern California on Obama's 2012 campaign before moving to Washington for stints at the White House and Department of Labor. Tom Malinowski, 52, who served as an assistant secretary of state for democracy, human rights and labor in the Obama administration, won in New Jersey’s 7th Congressional District, according to The A.P., where he'll challenge the vulnerable Republican incumbent, Rep. Leonard Lance. Also in New Jersey, Andy Kim ran uncontested in the Democratic primary in the state's 3rd Congressional District. He spent six years in the Obama administration, most recently serving as the director for Iraq on the White House National Security Council. On previous primary election nights, Rich Cordray, former head of the Consumer Financial Protection Bureau, and Betty Sutton, an Obama appointee at the U.S. Saint Lawrence Seaway Development Corporation, advanced their joint-ticket bid to be governor and lieutenant governor in Ohio, while Colin Allred won in Texas' 32nd C.D.